It's remarkable, given the strength of the Indian expat community in California, that Narendra Modi's trip to Silicon Valley is the first by an Indian prime minister for more than three decades. In that time, the technology developed here has changed India immensely. Mr Modi is here to make sure it continues to do so for decades to come, but perhaps now with more benefit to those back home. His visit, which was welcomed by more than 20,000 expats on Sunday evening at a stadium reception in San Jose, comes at a time when Indian and Indian-American success in Silicon Valley is truly formidable. There's the charismatic Satya Nadella in charge at Microsoft. There's the 10-year-strong reign of Shantanu Narayen at the top of Adobe. And more recently, Sundar Pichai took over as chief executive of Google - a role many said had been years coming. Indians in California say it's the blend of temperament and competitive spirit that brings success their way. "If an old school friend starts a company in Silicon Valley," one Valley-based Indian tech executive, Mohit Aron, told me, "I'm going to start an even better one". Mr Modi continues to ride the strong waves of support back home. A recent US think-tank study suggests 87% of Indians have "favourable opinions" of the leader. Outside the stadium, that enthusiasm was on full display - though not without the accompaniment of a strong protest against his government. Those not on "Team Modi" are angry at what they see as ignorance towards Mr Modi's past. In particular, they say he did little to prevent the killing of Muslims in the Gujarat riots in 2002. And when it comes to Digital India, Mr Modi's plans to get a billion more Indians on the internet, they say that's a front to mass surveillance. A letter, signed by more than 100 academics in Silicon Valley ahead of Mr Modi's visit, backed up this concern. They believe the positivity around his leadership, particularly in the Indian press, is more to do with aggression from the government towards its critics. Yet the support for Mr Modi in the US appeared genuine - and its his tech-savvy attitude to communicating that seems to impress people most. "We're very proud," said one supporter outside the stadium. The SAP Center is in San Jose, a city that sits at the bottom of Silicon Valley, a region where Indians truly thrive. Some 26% of tech companies here are founded or run by Indians and Indian Americans. That's more than the next five immigrant groups combined. Mr Modi has come here on a mission to bring some of that success, and wealth, back to India. To do it, he needs help. Before India can even begin to think of itself as a genuinely major technology player, it needs to cover the basics. Mr Modi, effortlessly adopting Silicon Valley's obsession with buzzwords, said the country needs both highways and "i-ways", by which he meant fibre internet, connecting each and every Indian town and village. Earlier on Sunday, Mr Modi spent time with someone who could help, taking part in a Q&A with Facebook founder Mark Zuckerberg. It was decidedly more A than Q, mind, as of 40,000 questions submitted to Mr Modi, only three were asked during the session. They covered the rewards of getting online, particularly when it comes to creating jobs. 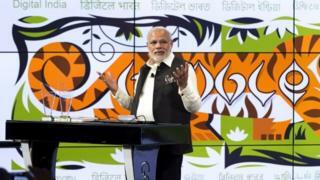 Mr Modi spoke of his delight at his tweets and messages to other world leaders "going viral". The last question, from Mr Zuckerberg, asked about Mr Modi's relationship with his mother. Pausing, Mr Modi became emotional as he told of cleaning dishes for those less fortunate. The prime minister even appeared to cry. An elderly Indian lady later told me it made her feel like he was "just like us". Those who see Mr Modi less favourably say that was exactly its intention, a staged display designed to build his reputation as a man of the people. The meeting at Facebook was mutually beneficial. Mr Zuckerberg, keen as ever to expand Facebook's user base and global influence, talked up the prospect of connecting a billion more Indians to the internet. In one of the most pointed exchanges in the entire session, Mr Modi said he hoped Mr Zuckerberg's motivations weren't purely about Facebook's bank balance. For Mr Modi, this entire Silicon Valley visit is a chance to put a little pressure on the tech giants. He wants India to graduate from being home to the low-end of the tech trade - call centres and cheap labour - and instead an attractive place to start a technology business. Indeed, he wants India to be a great place to start any kind of business, and reverse the trend of great minds, particularly in tech, heading to California. One parent outside the SAP Center, whose children were dressed in stunning, sparkling saris, said she believed when her girls grow up they will see moving back to India as a career aspiration - in the same way she saw the US as way to a better life.